Today I want to start a series of posts about a software application called Tinderbox. I’ve been intrigued by Tinderbox since first learning about it eight years ago, but could not give it a try until I picked up my first MacBook last year. Tinderbox is not an application that reveals its power with light use, so I wasn’t convinced to pay the steep price for it after casually running the trial version. Finally, however, I gave in when the application was discounted by $50 last spring. I began using Tinderbox intermittently, because I was still trying to understand how best to use it — you’ll see why in a moment. A failure to come to rely on any of the many other Mac-based information managers I’ve trialed and purchased has moved me to make a genuine commitment to using Tinderbox. My hope is that writing this series of posts will help me come to understand Tinderbox and how I might best put it to use. Also, it is timely that version 5 of Tinderbox was just released. This is a long-awaited conversion that allows Tinderbox to run more smoothly on the current Mac operating systems. Many people describe the learning curve for Tinderbox as steep… which is true. But one of the points I wish to make clear with this and subsequent posts is that you can get a great deal of functionality out of the application even using just the most basic features. I guess the first place to start is to try to describe Tinderbox, not in the developer’s words, but in my own. Like most, if not all, information managers, the core element of Tinderbox is the note. When you create a new document (which could also be called a database), you are creating a place to collect and store notes. Each note is in itself a collection of attributes. 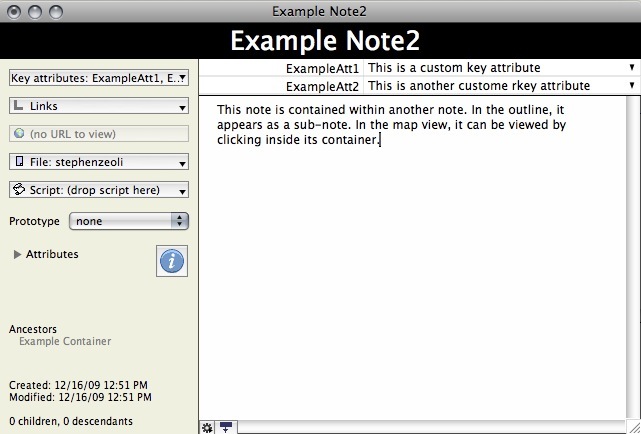 All notes have the same set of attributes, and you can create any number of custom attributes that can be applied to subsets of notes in your document. Think of attributes as fields in a typical database. Some of these attributes define the look and location of a note. Some contain meta data such as the date the note was created. Some define how the note might be exported. Some contain the pertinent information that you want to collect in the first place. The list of attributes is long and is intimidating at first, but you don’t need to concern yourself with most of them. 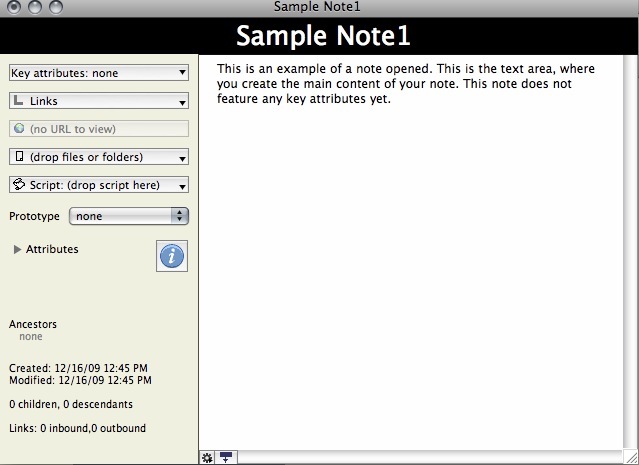 Key attributes are attributes you select for a note to display. In the screenshot below I’ve created a note with two key attributes. These are also custom attributes that I made up. I’ll talk more about key attributes in a future post. One of the most unique features of Tinderbox is that its user interface is so versatile. You can view your notes in several different modes. Three of them have proven quite useful to me: Outline, Chart and Map views. Map View is probably the most unique of Tinderbox’s many features, so that’s the view we’ll look at in this post. But first a quick word about what happens when you run Tinderbox. When you create a new document/database, the default view is outline. This is primarily a text-based view that shows the titles of your notes in a hierarchical list. As such, it will appear to be much like any other outliner. It is more than that, especially since version 5 has introduced the ability to add columns for viewing attributes. I will discuss Outline View in a later post, but want you to be aware that you have to specifically open a Map View using the VIEW menu, otherwise you’ll be a bit confused. Map View by itself would make Tinderbox unique. It is essentially a cork board on which you pin your notes. 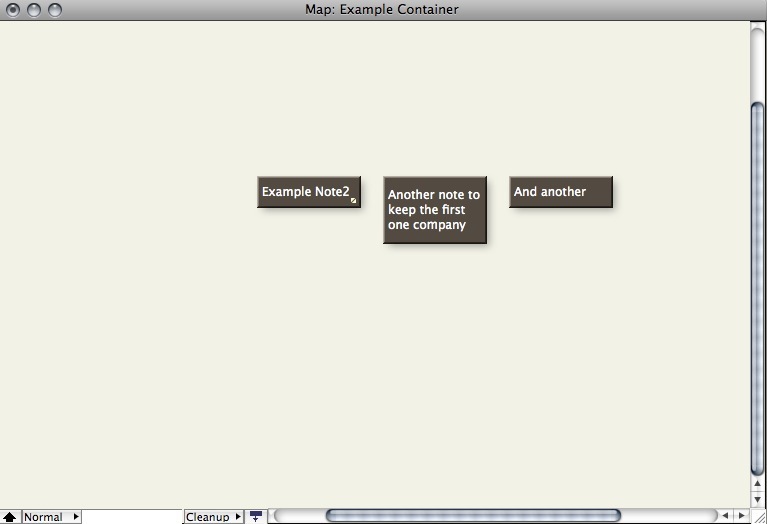 You can freely arrange notes on the map, visually grouping related notes. It is here that several of the note attributes become visual, effecting the shape, color and size of the note. 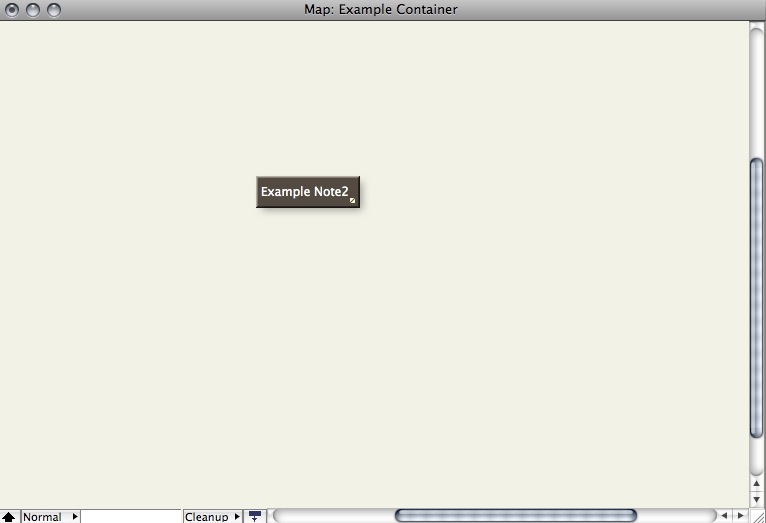 The screenshot below shows the second note pictured above collapsed in a map view. I know it looks a bit lonely, but it is easy to add many other notes. You can also fence off areas of the screen with adornments, colored boxes that stay in the background and in which you can group notes. Adornments are NOT part of the outline, and do not indicate hierarchical categorization. Let me give an example of one way I use adornments. For a publishing project I’m involved in, I’ve created notes that represent milestones and tasks. I added adornments as vertical columns, each of which represents a yearly quarter. Under these I created horizontally oriented adornments representing aspects of the project: editorial, illustration, production. 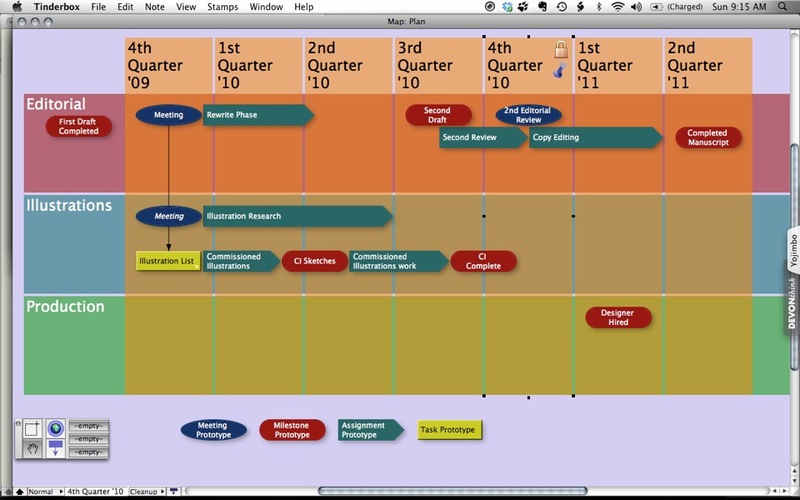 Now I can place the milestones and tasks on the matrix, so that I have a chart of the project timeline. What I’ve just described doing is easy even for novice Tinderbox users. Adornments can be used in many other ways. As another example, I have a document I call Thought Garage. In it I keep miscellaneous items and reminders, as well as notes that link to other Tinderbox files of current projects. I have an adornment set up as mission control, to house these links. I have another adornment called reminders, where I stack notes reminding me to do things. I’ve only covered the most basic ways to use the Map View in Tinderbox, but even at this level I think it is evident that Tinderbox is a unique thinking, planning and organizing tool. But this is just the first dimension, because Tinderbox provides the means of automating data manipulation. In fact, as far as I can tell, anything you put into Tinderbox can perform actions that effect other data. I’ll get into that in the next installment, as well as looking more closely at Outline and Chart views. Thank for tthis. I too am a user of Tinderbox and love reading about other peoples’ insight into the software. As it gives me much need reflection as to how I might improve and deepen my knowledge of Tinderbox. And am looking forward to reading your future posts on the topic. Thanks for the post. i bought Tinderbox about a year ago, having some idea about its potential. This post actually gave me the jump start that I needed to begin to explore its possibilities. I’m just happy someone has read my post, let alone getting some use out of it. I’ve become very fond of Tinderbox, but I’m still only a novice user. Many of its advanced features remain somewhat a mystery to me. But I hope to explore them in future posts. While I have not purchased TB, I am very intrigued by it for a few years. My schedule doesn’t allow me time to learn it all and its potential, but with this encouragement, I may have to reconsider. Thank you for these clear steps as you work your way through this program. I’m also new to Tinderbox, and really appreciate your posts. Very helpful. Thanks for taking the time. I bought Tinderbox a few years ago, and regularly upgraded it, thinking that this was the time I’d get my teeth into it. But the steep learning curve always turned me back. Your article showed how I can start using it with those colorful adornments. I liked both examples, and will do them myself. I guess I’ll skip upgrading my NovaMind. I’m glad I could be an inspiration for taking Tinderbox slowly and at a novice level. That is really the purpose of my posts — that and getting myself to learn the application more fully. It can be very useful even using the basics. What convinced me of this is a project I was working on last fall. I had to coalesce the comments from several people into one coherent critique of a writing project we had contracted. I fussed over this several weeks until I suddenly realized I could use Tinderbox. I took each document from the reviewers, snipped each individual comment (maybe 10 to 20 per reviewer). In Tinderbox I color-coded the comments, then created adornments as categories, and just manually pulled the appropriate comments into the appropriate category/adornments. I deleted or merged comments that were similar. When I was done I was able to export it to an rtf file, which I cleaned up and voila! Done in an afternoon! And I didn’t require any of the advanced features of Tinderbox. I would like to add my thanks to you for taking the time to publish this weblog. I looked at Tinderbox some time ago but decided to stick with Scrivener,OmniOutliner and OmniGraffle as I understood how these apps worked. But some 12 months later I find that my “information/data” is still in a bit of a mess stored in files saved in subject based directories scattered about my hard disc. Your post confirms a growing belief that with a little effort Tinderbox might be able to add some order to my chaos. I look forward to your ideas about the use of “Agents” sometime in the future. Thanks for the comment, Simon. I find myself in the same situation, with many options for storing and managing information. My situation is also complicated by the fact that I use a PC at work… although I’ve settled into a pretty good system on the PC. For the Mac and my personal work, I have found Tinderbox very handy for slicing and dicing information to help make sense of it. I wouldn’t yet, however, consider it my main information organizer. It can certainly function in that capacity and is worth a serious look if you’ve been frustrated with the other applications; this continuing exploration of the possibilities of Tinderbox is what my postings are about. I hope to put up the third installment shortly. Thanks again for viewing my post and taking the time to comment. Thank you for this post. Like yourself, I am also currently trying to wrap my head around the many ways of using Tinderbox. At the moment, I am using it as a learning tool. 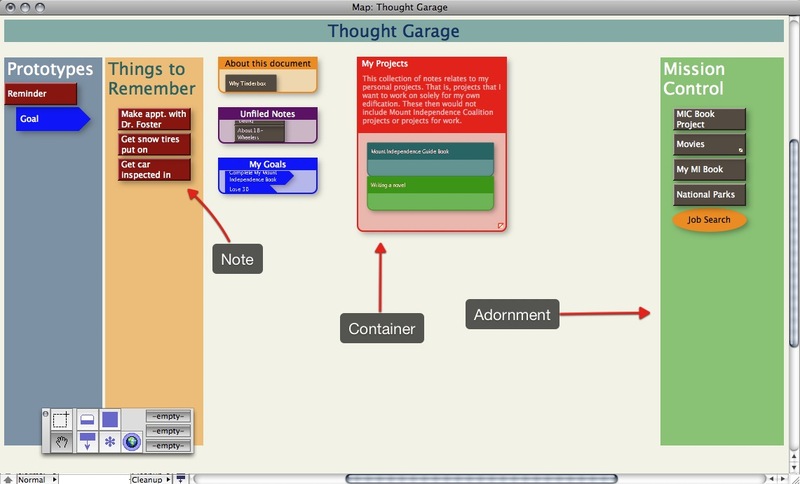 I use Tinderbox to organize and make sense of the abstract ideas in Quantum Physics. This post has helped me understand Tinderbox at a basic level. Keep it going! A side benefit of your blog is to find that others, like Donald Silva, have had my experience of regularly updating TB in the hope that this time we’d actually use it. I even went to a TB workshop in Chicago with Mark Bernstein et al. I’d recommend the experience and came home enthused – but still had trouble getting started. For me one problem is the rather un-Maclike look of the product. I know this sounds odd, as it’s built for Mac, but somehow its boxy aesthetic reminds me of an ’80s Dodge Aries. But back to your blog: let’s hope that it’ll actually prod me to use TB this time. Your first instalment has made a good start. I am sorry I didn’t approve your comments sooner. For some reason I was not being notified that I had received comments. Checking, I see there are several that were pending approval, and I’ve approved them all. Tinderbox is a real conundrum. I love it, but it has not become my main information manager as I hoped. I use it, instead, as a space to think and analyze. For that, I find it unsurpassed. The main problem I have with it is exporting items. I hope to get into that in a future entry. TB may need to be supplemented by some kind of tool into which you can dump everything, for later processing by TB as needed. (For those familiar with GTD, you need an Inbox.) The Eastgate people behind TB recommend Yojimbo (though I don’t think it’s their product) for accomplishing this task. Me, I’ve been using Evernote (http://www.evernote.com). The trick, it seems to me, is to coordinate TB with some kind of Inbox, since otherwise I’d agree with Vermonter that there’s no way TB alone can be one’s “main information manager”. Hello. I happened upon your website while I was searching for something completely unrelated. While I don’t agree with everything you said we do have almost the same viewpoints by and large. I have bookmarked your web site and will visit again in the near future to see what you are writing about in 2010! I’m waiting for someone to make a Mac version. As it is, Tinderbox is user-unfriendly and counter-intuitive. Some great ideas there, but you need to be a programmer to use it, as far as I can see. I can’t squabble with your frustration, but you do not have to be a programmer to use Tinderbox. I am far from a programmer, and I get lots of use from it… admittedly not to the extent that people comfortable with programming can and do.